For those of you who haven't heard of e.l.f. cosmetics, allow me..
e.l.f. stands for eyes, lip, face. 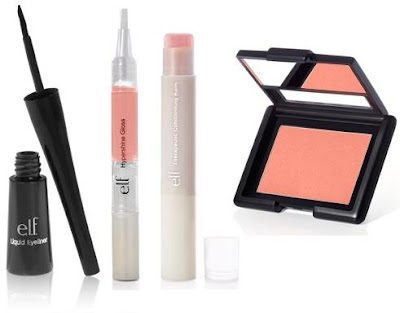 Beauty necessities on a budget. Take a look at some of my latest pieces. Would you believe it if I told you that you could get all of that for $6! The blush is the most expensive, at a whopping $3, the rest is, you guessed it, a dollar a piece. I have yet to try the brushes because I'm still using my trusty MAC ones, but should they ever fail me, I know where to turn. Last night, we painted Landyn's room Cobalt Blue. The theme is going to be Sesame Street with an emphasis on Elmo. I'll be sure to update you with pictures as soon as it's completed. I finished 'The Best of Me' on Thursday. If anyone is planning on reading it, let me just say, it basically mirrors The Notebook. Still a very good book, just don't like the common denominator that is inevitable in a Nicholas Sparks book. It's Saturday night and I just got home from watching The Help at my Mom's. Amazing movie. Have a tissue, or 10, nearby. Now, I'm just sitting at home, catching up on some TV. I made my first e.l.f. purchase today and am pretty impressed, so far! 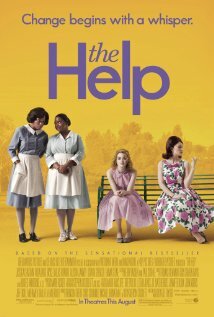 The Help is an amazing movie! I love elf products!! I found them last summer and started using them and i keep going back. The only things I haven't gotten yet is the mascara (cause I use 3 and I'm picky about them) and anything for my face cause I have sensitive skin. It's hard to believe products can be so cheap and actually work!! i got some e.l.f. eye shadow from my cousin for xmas and i really love it! I really want to do my sons toddler room in sesame street but my husband really wants to do superheros! can't wait to see the room! that is so weird you are starting that book...i will be starting it this week too!